The combination of red and white is considered highly effective and it is widely used for many art representations and brand building. 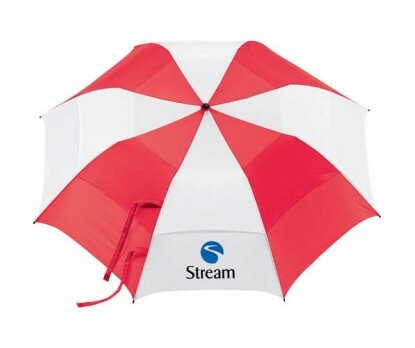 Automatic open promotional red & white striped 58” arc golf umbrellas are largely sought by marketers in beauty, construction, interior designing, lifestyle, fashion and creative niches. As, they feel that personalized red & white striped 58”arc vented golf umbrellas truly portrays their business interests and improves their visibility factor. Custom red & white striped 58” arc vented golf umbrellas not only offer a formula for easy recognition, but also easily reliability and long term services. Equipped with gentle foam handle with waist strap, automatic open function, sturdy 2-section hexagonal folding metal shaft, red & white alternated large vented nylon canopy and sturdy fiberglass ribs. Matching color case is offered with shoulder strap. Imprint area - 6" H x 8" W. Dimensions – 58” arc folds to 21”.